Now that it’s December, the winter weather is well and truly on the way and, for those of us who use cars to get around, this can be a hazardous time of the year. Freezing temperatures, ice on the surface of the road, heavy snowfall and strong winds all play their parts in making driving something of a challenge. It’s important, therefore, to ensure that your car is operating in near-perfect condition to ensure that it can handle whatever Jack Frost throws at it, from rain and snow to sleet and fog. With this in mind, it’s definitely worth taking the time before the weather gets too bad to give your car the onceover on everything from its sunroof to its tyres. You may spot something that could cause serious trouble if left undealt with – better to handle it now than have to try and change a tyre on a side road in the middle of a blizzard. It is important to ensure that the levels of coolant and oil within the car’s engine are topped up – if there is too little of either then the engine might not work effectively and could become damaged in the process. The coolant could also freeze inside the engine, causing all manner of issues. Use a dipstick to check oil levels and assess the levels inside the coolant tank. If you need to put more coolant in, add some antifreeze and sealant solution as a pre-emptive measure against the formation of cracks and holes that could cause leaks. Your brakes generally need to work anyway, but it’s doubly important when the roads are slippery and braking distances are increased by up to ten times. Keep an eye on the way the brake pedal feels – it should be smooth with no pulsation when you press your foot down – and check the brake pads. They start at about half an inch thick, so if they’re down to about an eighth of an inch then they should be replaced. The rotor disc should also be checked for grooves, which affect the friction of the brakes (the discs should be smooth to ensure maximum friction). If grooves are present, have the discs machined to get them out or replace them entirely. One of the most annoying things about driving in winter is the fact that you have to defrost the windshields (front and back) every morning before you can go anywhere. 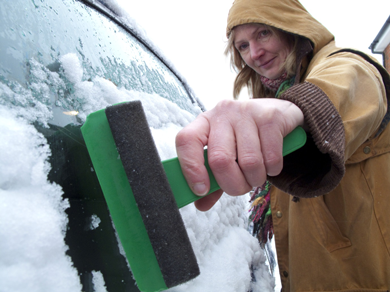 While you might have a scraper that you will use, the job will be a lot quicker when you turn your heating or defroster on. You’ll also want to warm up as soon as possible! You should, therefore, ensure that all wires are still connected and that heating vents are free of blockage so you can get out of the drive more quickly and avoid having to wear six layers on your way to work. You may want to go further and double-check that the car radiator is working as well. Your brakes are only as effective as your tyres – if they’re not up to scratch in terms of their pressure and tread then your brakes won’t do nearly as much good as they otherwise would. Some motorists reduce the pressure of their tyres during the winter because they believe it gives them more grip. In fact, according to the AA, this doesn’t work and actually reduces the vehicle’s stability. It’s a much better idea to simply fill the tyres with the recommended amount of air after replacing them, if necessary. Tyres on passenger vehicles are legally required to have a tread depth of at least 1.6 mm (some experts recommend at least 3 mm for winter driving) in order for cars to have enough grip on the road. Drivers should change their tyres if they happen to be lacking here, especially if they live in areas prone to heavy snow and ice. Winter is especially hard on batteries. The car’s power output drops; the battery doesn’t recharge as quickly as you drive and its general workload increases because more of the car’s capabilities are being used now, as opposed to summer. Coupled with the fact that many cars stand unused throughout the Christmas period, it is no surprise that most breakdown repair companies have their busiest days on the first day of work in the new year! Get under the car bonnet and see what the battery’s looking like. If any clamps or cables are frayed then they should be replaced, otherwise they may short-circuit and cause major problems. Clean the battery acid deposits off the top of the battery to ensure a strong electrical connection and make sure you turn everything off overnight to avoid wearing it out. Unsure Of The Problem With Your Car Engine? Quickly diagnose and resolve car engines problems with our expert guides.